For guys, more than ever, it’s a confusing world. Your GPS doesn’t offer any maps showing how to get to the point of wisdom -- and who likes asking for directions anyway? I like the layout of this book, very basic and to the point. I love the whole idea of gaining wisdom from your wise peers around you. It seems difficult to find these days; a wise, Godly man of any age. So on that note I think this books presents what that is and how to know who a wise man is. There are many stories which are somewhat entertaining but not necessarily captivating. I wouldn't say this book drew me in and my husband is still having a hard time getting through it. Honestly, it is full of things we have heard before (not the funny stories of course) but the overall idea. I think for someone who hasn't read a book like this, needs a fun guidance book, or perhaps is a new Christian this would be a great book. So I'll say it's a good book, just not a great book. "I received this book from Flyby Promotions for free in exchange for an honest review." US and Canada only please. 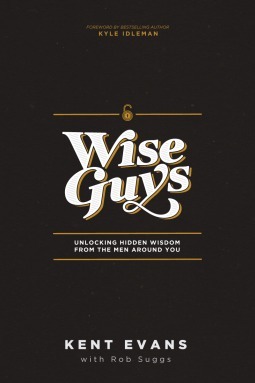 Giveaway is for one copy of Wise Guys by Kent Evans.